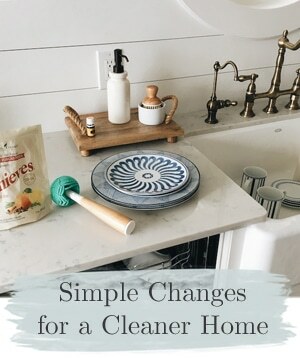 My projects take on average about 50.34323 times longer than other blogger’s projects do to complete. This is now a scientific fact. I almost called this post DIMS: Powder Room Vanity Before & After. DIMS would stand for “Did It My Self” instead of DIY. (OK, that DIMS thing sounded funnier earlier to me for some reason and now that I am about to post it, I don’t even get it. DIMS? Whatever. Nevermind). I just have to fit these projects in around all the other things I do, or it will never get done! And yay! I fit it in because friends came over to help me! I am always happy to report my progress because it just makes me feel like I am in fact heading somewhere with my house, even if I meander around like a crazed snail. So today I present to you a piece of the powder room project: the vanity BEFORE. Remember, I am not a wood hater. I love beautiful wood. But I am an ugly faux wood hater. There is definitely a distinction there. This wood cabinet was, in fact, an impostor — it was simply faux painted wood. Which means I was released from all guilt or blame and could wreck it all up with paint to my heart’s content. Not sure what it is actually made of … maybe a laminate over particle board or something (but it feels very solid and not fake). But, you’d never know it wasn’t really wood now! 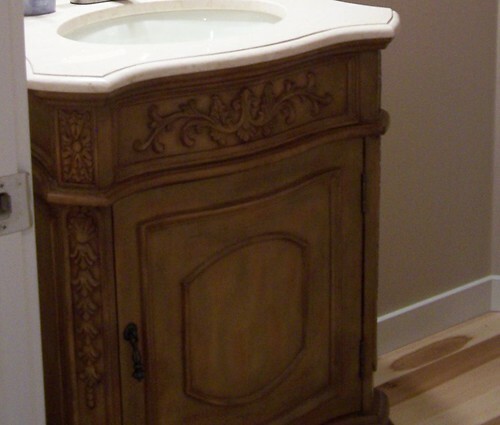 It has been born again….it has new life as an old antique wood cabinet turned vanity. It was easy peasy to change! It is hard to show pictures of this because the powder room is so dark and has no windows! I am feeling pretty brave to show you my close ups because you can see the paint drips and so not amazing antiquing job (that I am going to paint over with one final coat of paint). My imperfect painting also goes to show you can let go of perfection if you allow yourself a little shabby chic! It is the perfect style for imperfect painters like me. You could embellish a plain cabinet, by the way, by getting some of those fancy flourish things at the hardware store. This was already a highly embellished fake carved cabinet so I didn’t have to do much at all. A coat of Zinsser water based primer will stick to anything, no sanding was required. SCORE! Love no sanding. And a quick coat of white paint (and a final coat which I will do later this week) and you have your reborn cabinet. I was envisioning a new green glass knob which would have been very pretty and appropriate, but then we remembered we already had this checkered Anthropologie knob sitting around and decided it would be fun, quirky and unexpected. And free. Here is another angle…cause all the cool bloggers show you every possible angle of the same thing. I almost took one at an extreme sideways angle so you could get the full blogger “after” effect (it always makes your project look way better than it is if you have that angle, doesn’t it? I kid!!) but those kind of make me seasick. More updates to come on this tiny bathroom cosmetic makeover! One step at a time! I heart you for coming by to see my little project! HEART. I’m sharing this DIY post with DIY day at Kimba‘s. Gorgeous…it has such a fun shape. Agreed…mustbepainted! Great job! .-= Infarrantly Creative´s last blog ..Teacher Gift Idea =-. Looks SO much better white! That’s a really cool looking vanity. Very unique, love it. Soooo much better painted! Very pretty, Melissa! .-= Tracy @ Comfort&Luxury´s last blog ..Books and Chairs : Two Great Things that Look Great Together =-. It’s fabulous! I mean, seriously fabulous! Envious over here! .-= Kacey´s last blog ..Happy Monday! =-. .-= Laura´s last blog ..Make a Difference Mondays =-. It is GORGEOUS! I can understand why it HAD to be painted. This is a huge improvement. :) Great job! .-= Violet@CreateBeauty´s last blog ..Art. Books. Friends. Summer =-. this really turned out great but I’ve decided I need to get out more. How bad is it that I looked at that knob and knew it was Anthropologie.? :) Seriously, looks fabulous. .-= pam rosenberg´s last blog ..Yellow Front Doors Are Not For The Faint of Heart or Neighborhood Rebel =-. 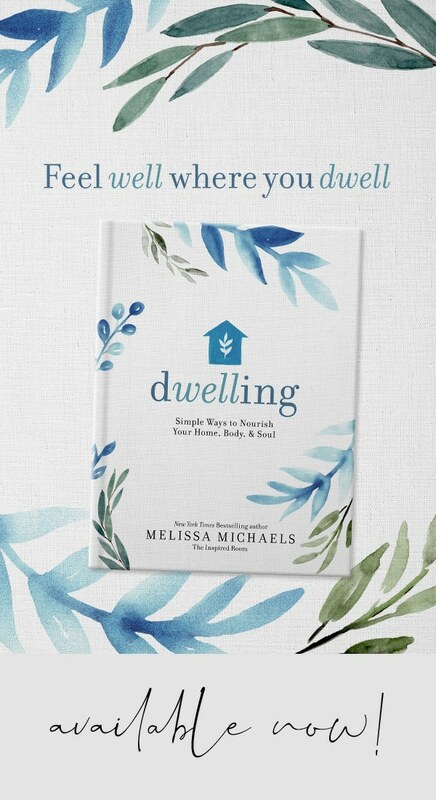 Melissa…this looks great! I’m totally with ya on guilt free painting of faux wood. :-) Love the fun knob! .-= Susan´s last blog ..Welcome to the 70th Metamorphosis Monday! =-. Looks fab! No guilt here, even when painting real wood. I tell myself if I ever change my mind it can probably be sanded and refinished. Though in 15+ years I’ve never wanted to go back. Even painted solid oak end tables and a sofa table antique white then distressed them. The only thing more distressed was my Mother who couldn’t believe I’d do such a thing. Six years later she still laments the loss when she glides her hand across. I, on the other hand, think they look great. Love the details in the cabinet. Would have never known it to be fake wood if you hadn’t pointed it out. LOVE it! Absolutely beautiful! Can’t wait to see the entire room! .-= Myra´s last blog ..Chocolate – Strawberry Trifle =-. It turned out just beautiful! Love all the architectural elements. It looks waaaay better now! .-= Kara´s last blog ..DIY Nasty to Nice -Desk Wall Redecorated! =-. Great job! I also am not a fan of the faux wood thing–really nice job on that transformation. .-= desiree@lookiloos´s last blog ..Los Gatos Victorian =-. Love the vanity painted white. Now it has character and looks like a piece that you found at an antique store or got at auction! As usual…you inspire! What a wonderful improvement over the “before” and I love the knob including the story behind it (use what you own kinda story) ! Thank you so much for sharing ~ it encourages me. Your bathroom vanity turned out GORGEOUS! I love it! .-= Ann´s last blog ..SCRAPABLE MOMENTS!! =-. .-= Rachael´s last blog ..Candlelight =-. Love it white, Melissa! Looking forward to seeing more! .-= Kathy @ Creative Home Expressions´s last blog ..Screen It =-. LOVE it! the knob is a really sweet touch! .-= Jess @ Frugal with a Flourish´s last blog ..A No Sew Outdoor Pillow =-. it’s gorgeous, Melissa! I don’t see a single imperfection. .-= Emily@remodelingthislife´s last blog ..Life With Chickens =-. Oh wow! Melissa, it is gorgeous!!! I just love how you aren’t afraid to just be yourself. You always make me smile. Thank you for being so real with us. It gives so many of us the courage to step out and try something ourselves…no one is perfect and you make us feel comfortable trying something new…and you show us how beautiful it can be!!!! Thank you!!! .-= Mary Joy @ Snapshots from my Heart & Home´s last blog ..Creating home…the desire of my heart. =-. I love DIMS because that’s how I live too. If I need something done, I Do I My Self. And you did a wonderful job with this project. I fell in love the with cabinet last week when you gave a sneak peek. So glad it got the full blogger treatment with a post of it’s own. .-= Heather @ what’s happening this week´s last blog ..Inspired By…..Saturday Morning Walk =-. .-= Gina´s last blog ..Finally… =-. Beautiful! That’s exactly what I’d like in my powder room. Do you happen to know where the original version (yes, it would get painted asap) was from? The vanity has waaay more character since it has been painted white. Looks fabulous. I love the knob you used. I chose the same knob to use on a vanity we painted black for my daughter last summer. Great job! Yes, indeed, you are released from guilt. No doubt that this looks better painted. So long, swine walls! Farewell, fake wood! 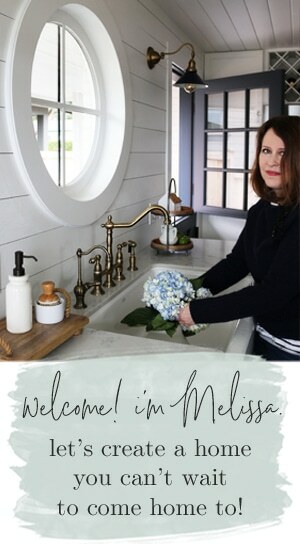 Melissa’s powder room is going places! .-= Richella´s last blog ..Nineteen candles =-. Painted white wood is just fabulous! I love that cabinet. It was beautiful to begin with…. and so gorgeous painted. Looks great, Melissa!! I love what a little paint will do. I was just in Anthropologie & you know that Hobby Lobby carries SO many of the exact same knobs that they do & with their 1/2 off sales, you can’t beat HL. I was surprised how many of the same knobs they have in common. A crazed snail… giggle snort! I’m one too. .-= Donna´s last blog ..Home 3 ~ Athens, GA Garden Tour =-. That vanity is beautiful in white. I’m new to your blog and want to assure you that I probably take longer than you to finish projects. Can’t wait to browse your site and read more! I think your vanity turned out wonderful! I like it so much better painted white. Good job with the DIMS. I can’t wait to see the rest. .-= Traci Hutcherson´s last blog ..Parties — not projects… =-. The cabinet looks great! But wait, no sanding?? I’m sorry to tell you my husband is going to hate you a little bit now, you’ve taken away his one and only weapon to keep me from painting everything in the house. I say “I’m going to paint xyz”, he says “ok, but you’ll have to sand it”. He knows I’d rather poke myself in the eye than sand. That is a GORGEOUS vanity and exactly what I have been looking for!! Where oh where did you find it my dear? And not only that but David would love it too (huge plus there)……. .-= Vee´s last blog ..Yellow Roses =-. Love it! Love it! Can’t wait to see the rest. You’re hilarious! The “extreme sideways angle”..HA! And I think I have you beat with how long it’s taken me to finish my master bath. I’ve TOTALLY lost motivation there. And I’ve been working on that projects since….1984. So there :). 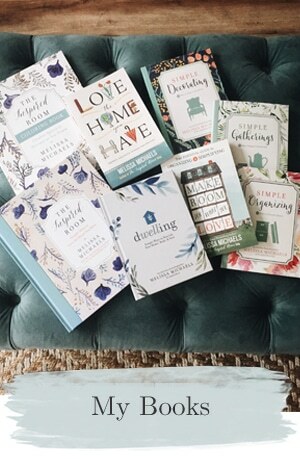 .-= AnNicole@OurSuburbanCottage´s last blog ..Anthropologie Dreaming =-. Oh what a great DIMS project, my heart is going pitter pat. You are one clever and crafty girl. .-= Laura Ingalls Gunn´s last blog ..You Raise Me Up =-. Anthropologie has the best knobs! I find myself purchasing them, eventhough I have NO PLACE TO PUT THEM. Oh well. Maybe someday I’ll stumble upon a perfect opportunity, just like you. .-= Camberley, The Bella Life´s last blog ..Quote of the Day =-. Looks awesome! I love that zinser-the best stuff for those kinds of projects. And the knob is a cool touch-nice job! 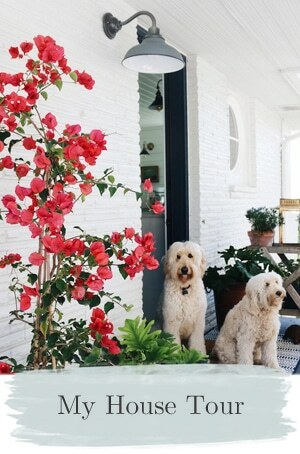 .-= Gina´s last blog ..Inspired by Flowers on the Front Porch =-. Melissa, The vanity looks great all painted in white! I can’t wait to see the finished room. Have a great week. .-= Sherry @ No Minimalist Here´s last blog ..Junkin Treasures + Giveaway =-. Love that knob. I think it truly is a fun addition. I like the idea of the green glass knob too. But this is a great alternative. And nice job overall! It makes me feel good that folks like you don’t do perfect paint jobs either. .-= Lesley @ TheDesignFile´s last blog ..Easy accents for summer from Kohl’s =-. .-= meg duerksen´s last blog ..how does this make you feel? =-. .-= Laryssa @ Heaven In The Home´s last blog ..Natural Soap Giveaway Winner! =-. Looks amazing!!!! You totally gave it new life. I love it! .-= Jocelyn Stott´s last blog ..Wedding Recap: Part 1 =-. It does look so much better painted. I am never afraid to paint anything and I think you will love it when the bathroom is all finished. I can’t wait to see the completed project! .-= Melanie´s last blog ..A Teenagers Bedroom =-. .-= Alison Gibbs´s last blog ..200th Post and a Giveaway =-. The vanity cabinet looks lovely in the white. It looks custom and chic. It was well worth the extra time. .-= Miss Mustard Seed´s last blog ..A Rocker & A Caddy =-. I heart you no matter what – DIY project or not! .-= Sandy´s last blog ..Too Busy for Strawberry Shortcake? No Way! =-. I love it Melissa!!!! It is gorgeous! I love everything, except for the knob. Go out and get that green glass one! Love it. 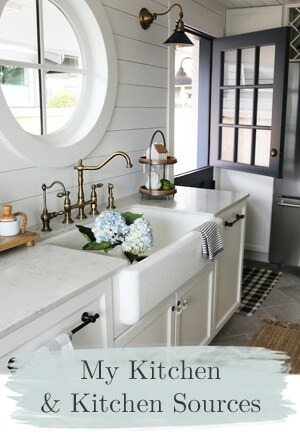 I am getting ready to redo my bath — I also want to go lighter with my cabinets. Awesome job! OMG! That came out fantastically beautiful! J’adore. I saw that black and white checked knob and knew right away it was from Anthro before I even read your post. I think that means I go into Anthropologie a little too often. .-= Condo Blues´s last blog ..Make a Compost Bin Out of a Plastic Storage Tub =-. I know what you mean about a GOOD piece of wood. I have a few of those pieces. But I never feel bad to paint up an old beat up piece, and just cheer you on for slappin that white all over anything that is faux painted wood. it looks fabulous! That sink – WOW it’s gorgeous! I believe they are Mohawk natural hickory floors, I got a sample from Lowe’s that looks exactly like them! Hope that helps! I love the powder room can you share with me the color name and the brand. I LOVE the color. Soo this weekend I printed your photo. Went into our powder room and strip all the wallpaper what a job that was. We move into our house 1 yr ago and now its time to claim this house and make it our home. I LOVE your ideas!! Excellent choices!! The walls are Snail shell by Martha Stewart! Strip the U G L Y wallpaper! Hardwood is going down in the morning! Yes & hubby agrees to angle the wood and we have move out into the mudroom……….started with redoing the shelves than the closet the mudroom was painted he thought he could keep the design BUT…once he saw what it looked like with the shelves newly painted he agree with new color and today the closet was taken apart & yup you guess it NEW PAINT COLOR!! What a week its been!! WOW lots of late nights but in the morning we will have new floors!! Oh I can’t wait! PS we painted doors & trim poor hubby is a dish rag snoring in the chair while I am braging him up! I love this cabinet, it looks exactly like the one I bought in a furniture store, but it was already white and has two doors instead of one. All else is the same. We put it in my beloved little craftsman, but I’m seriously thinking of taking it and putting it in the farmhouse we are in the process of purchasing. I’m a country girl who has lived in the city most of my life. I am so excited to have the opportunity to live the country life. and thx for the primer tip!! yay for no sanding!! Could you please tell me where you got this vanity? I have searched the comments and could not find the answer.